We made it safely to Chicago for this Casual Furniture Trade Show. [Interestingly, “casual furniture” is defined as stuff that can get rained on.] Benji drove almost the whole way, while i realized i cant quite do the “extrem schwer” Sudoku that Premin gave me (the very hard ones are just fine tho). We are here to sell hammocks and evaluate if we want to keep spending $25K plus to do this event. More thoughts on this in some days. I’ve started trying to defriend a person or two a day from Facebook. I tend to be a bit liberal in accepting friend requests. If someone looks like they are doing anything worthwhile or whimsical at all, has some friends of mine whos judgement i think is reasonable or especially curious. i will say yes. But if they have lots of unoriginal happy birthday msgs, or lots of trip reports from their european vacation which look like we would not have much to do with each other, or if there is a long list of TV shows they love and not much political or clever in their profile, i will cut them. Nothing personal. They might be wonderful people, have charming lives, be doing good and lovely things in the world. But we are not friends, the social media does not create a relationship. So i have 648 friends today on Facebook. Two less than yesterday. I think it’s great that you’re rethinking the value of doing the Casual Furniture Trade Show. I don’t think it’s the best way to spend 25k. Freeing up that money to do some other sort of (wholesale) advertising would probably make more sense (if advertising is necessary at all). 25K is A LOT of Hx worth of business. So you’d be way ahead of the game just by cutting out that expense. It is unclear we will quit the Trade Show. We are going to ask all of our wholesalers who come to this show and our sales reps. I’ve been calling customers for the last couple of weeks. All our biggest customers are coming, several to negotiate with us. Some this is the only time we meet them face to face. Perhaps we will quit the show, but i dont start from the place of being sure of that at all. my dear, i find it hard to believe you are actually taking time out of your meaningful and hectic existence on earth to defriend somebody. i seriously urge you to waste two or three additional seconds of your life to reconsider this philosophy. 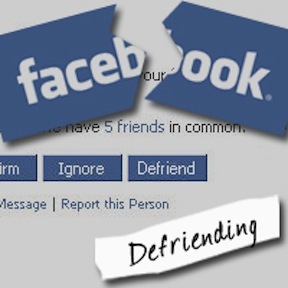 Is defriending going to change anything for the better? Cause folks to reconsider inane birthday messages or the meaninglessness of their outer lives? Force a meaningful exchange in what is, essentially, a self-sponsored public CIA file? And if the goal is to punish the superficial, I must admit, I think your voice & views are much better used to entice folks out of complacency. Reading your posts is inspirational and interesting. You might not be getting much from some of these folks, but they are getting something from you. And anyway, i think it’s just plain mean, and shows a smallness of spirit which I know you do not have. Be generous in these things. Stay connected. Save your fabulous magnetic energy for better revolutions–things that bring people together, not defriend us apart.